I just can’t stop smiling and being inspired because I saw real journalists, and I was able to listen to their stories. I am so excited to be like them. I took Development Journalism as my major, because of several reasons. First, I want to write, and improve my writing skill. Second, I like interviewing different kind of people and sharing their stories. Third, I do not believe those students who say that DevJourn is difficult, stressful, and boring. I think that it is really fun and exciting. 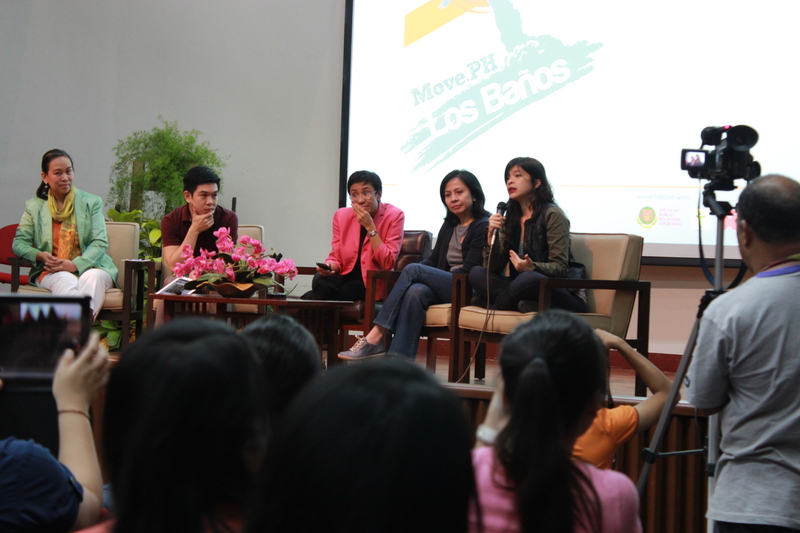 Fortunately, I was able to attend the Move Chat Series of Rappler, an emerging social media. I don’t have class that whole afternoon, but I have a scheduled interview at DTRI for the feature I am working on. So, I left the forum at about 2 pm and came back at 3 pm. I thought that I will not be able to learn a lot from the forum since it was already late, and I have missed several discussions. I was wrong. I got new ideas from the forum. In Dev Com, we are always tasked to look for interesting and development-oriented topics. Before doing anything, we always have to consider three things: topic, audience, and objectives.Chay Hofileña, Citizen Journalism Director of Rappler, discussed about the usual elements of a story, and gave us examples of unique stories that Rapplerhas featured. We are very familiar with the 5 Ws and 1 H of a story. Hofileña said that what we forget sometimes is the “so what?”She said they feature stories that mainstream media would not care about. She mentioned their story about the Muslim mistahs in the PMA, and their article on inter-faith issues like the wearing of hijab or the Muslims’ headscarf. Rappler had also featured unique personalities like Reina Reyes who is a young achiever in the field of science. At a young age, she already got a doctorate degree. “Her story should be something that will inspire the youth,” Hofileña said. Science stories in mainstream media are mainly about new diseases or drugs or about technologies. It is good that Rapplergives a face to science stories. There are probably thousands of stories about poverty and most of them describe how hopeless, voiceless, and powerless the poor are. Hofileña said those are “tired topics.” She said they have a story about poverty but they focused on an angle that is different from the usual. She told the story of Gacer, a woman who lives in poverty but who was able to organize their community to fight the demolition in their area. Another usual topic is corruption. Hofileña cited the PUP protest. She said, “We are used on administrators controlling students. But who’s checking on the administrator?” That story was about students checking on their administrators. Hofileña said students should report or voice out what they see as wrong. Stories about education, corruption, poverty and other cliché topicscan be transformed to new ones by having fresh ideas and knowing what unique angle to focus on. I learned that in making a story, I have to focus on person, know his/her problems or achievements, and then I look at the big picture and tell the story. Chay Hofileña said they are looking for stories having human faces and emotion. She said, “Don’t go theoretical immediately. “Without heart, without feeling, there is no story,” she added. I just realized that it is important to zoom in first before looking at the bigger picture. What I always do is the opposite. I always identify stories by first looking at the broad concepts and then I identify a personality that will represent or give a picture to my story. I now think that it is easier to find an interesting topic if I start by identifying persons who have interesting stories. “Look for that emotion and tell it,” said Hofileña. “Have a clear voice and direction. What exactly are you saying?” she added. Here, I remember that our Dev Com teachers never fail to remind us of the importance of clear and effective writing. Hofileña also emphasized the diversity of ideas. She said they are tired of politicians and that they want the ideas of students or those who have young and fresh minds. She stressed that we are tired of the usual stories about crime and politics, and we want something new. We could achieve that by having the passion and inspiration. “All you need is a foot in the door,” said Hofileña. Michael Josh Villanueva, Rappler Special Projects Director, talked about social media’s power to implement change. His talk was specifically about the “powerful” features of the social network giant Facebook. Yes, social networking has a dark side or negative effects like cyber bullying, but it also has the good side or its advantages. And that is it gives people the power to implement change, buy making other users to be informed and act through social media. My stereotype of a journalist is that he/she somehow looks haggard and is very formal. I think Patricia Evangelista, Rappler Multimedia Reporter, is not the typical type of a journalist, but I like her and I agree with what she said during the forum. She said, “You cannot move people if you cannot move yourself.” It’s like you have to be confident about yourself, your ideas, and your story. That is something that I still have to develop or improve. Evangelista said that in every statistics, there is a face, there is a story. She said that when you encountered an interesting story or when you saw it in front of you, you can’t just keep it. It is like you have the obligation to share it to other people. I like it when she said, “Not every story is just black and white.” Stories may just look plain, but if we go deeper, and if we are creative, we can add color to it. When the Rappler journalists were asked if they would like to quit journalism, they all said that they did think of quitting at some point of their lives. What would you expect of people whose lives are in danger when covering controversial stories? What would you expect of people who have very demanding schedules? What would you expect of people who allot minimal time for rest and sleep? Amidst the “difficulty” of being a journalist, they still can’t let it go. They are still in the field of Journalism, the field that they must have fallen deeply in in love with. I am just so inspired by their stories. I want to experience the excitement and “tension” of being a journalist. I guess I made the right choice when I took DevJourn. As of the moment, and in the future, I don’t think I will regret loving Journalism. I was touched and inspired by Rappler’s ripple.